This organic form of calcium is one of the most bio-available forms of calcium that is easily and effectively absorbed by the body to prevent a shortage of calcium which can result in osteoporosis fragile bones etc. But calcium has many other functions apart from keeping your bones healthy. 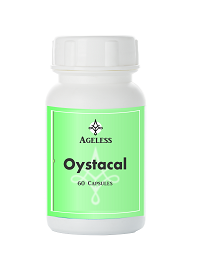 Our OystaCal Calcium Supplement is made from oyster shells – which is organic and natural and extremely bio-available to the body and it is therefore extremely well absorbed. Each two tablets contains 2500 mg calcium carbonate per 2 tablets (125% of RDA) plus 500 IU Vitamin D.
Added to the organic calcium from oyster shells (which is highly bio-available to the body) we added Vitamin D to improve the absorption of the calcium. Calcium is an essential mineral for the diet of all humans and is especially important for women but not exclusively so. This humble mineral is involved in many body functions – teeth, bone, muscles, mood – to name only a few. Some organic oyster shells may contain heavy metals. Our shells do NOT contain heavy metals and the calcium has been purified – so there is no danger of heavy metal contamination. reduced ability of the body to detoxify itself and many more. Calcium is needed for the formation and maintenance of bone, the development of teeth and healthy gums. It is necessary for blood clotting, stabilizes many body functions and is thought to assist in preventing bowel cancer. Calcium has a natural calming and tranquilizing effect and is necessary for maintaining a regular heartbeat and the transmission of nerve impulses. Calcium helps with lowering cholesterol, muscular growth, the prevention of muscle cramps and normal blood clotting. Furthermore, it also helps with protein structuring in DNA and RNA. It provides energy, breaks down fats, maintains proper cell membrane permeability aids in neuromuscular activity and helps to keep the skin healthy and also stops lead from being absorbed into bone. Vitamin D helps with increasing the absorption of calcium, assists in bone growth and the integrity of bone and promotes strong teeth. It also helps regulate the amount of phosphorus in the body, as well as assisting in a healthy heart and nervous system. Vitamin D has been shown in recent studies to have great promise in assisting psoriasis as well as your immune system, thyroid function as well as normal blood clotting. Absorption of calcium may be reduced if there is a deficiency of vitamin D (that is why we include vitamin d in our formula), a high intake of dietary fiber, a diet in raw whole grains, a diet high in saturated fat and by a high phosphorus (found in fizzy drinks) and a high protein intake. Calcium excretion is also increased by caffeine and sodium (in salt) intake. Stress has also been found to increase the excretion of calcium. Refined foods are also lower in calcium than unprocessed foods. All these conditions and factors which lead to impaired absorption or loss of calcium from the body, result in a deficiency of calcium in the body and may result in a shift of calcium from bone to soft tissue. This may promote osteoporosis and also arteriosclerosis and high blood pressure. Calcium deficiency often does not resolve unless a sufficient magnesium intake is also maintained. High intake of calcium and potassium may also prevent some of the harmful effects of excess sodium (table salt) consumption which is prevalent in our society. Take one to two capsules daily for the maintenance of good health. Provides 125% of your daily required calcium plus vitamin D, to ensure proper absorption. The organic calcium is in a natural and easy-to-absorb bio-available form. Helps to fight osteoporosis and excessive bone loss and required for strong teeth. Calcium is not only required for bone health but for various other body functions.